Ah. The ubiquitous Dish of Child. I am already in my declining years. I do not need to decline any other bloody thing, thank you. I politely decline to decline any declinations. However any brats screaming around the restaurant, (who bagarapim sindaun bilong mi) I will drown in the Goldfish Pond. Tokpisin = Destroy my peace and quiet. I make noise. Here, have a dish of I scream. I make noise! Especially after eating beans. Child people like eating child. They like to inspect noisy and running child before they devour them. 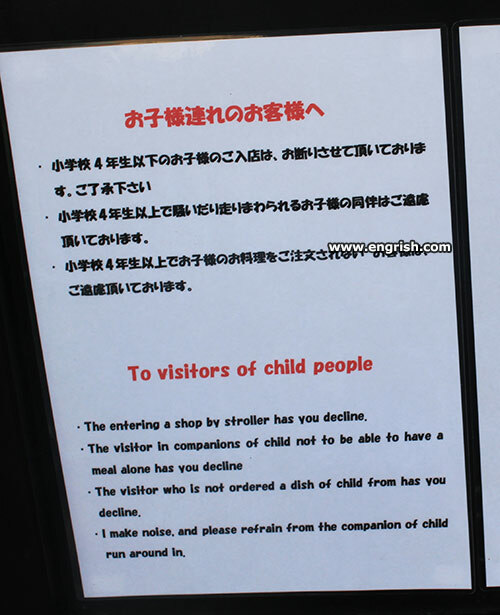 Declining child people means no business. Run in around may get you a child. Waiter, there’s a heir in my dish of child. How much Moore can child people take? A child strolls into a bar and starts to howl. A visitor is someone who pos in and out. Visiting child people will get you 7 to 12. EDIT: pops in and out. So, are you going to approve my loan or what? – Honey? I see child people! – That’s our daughter, darling. Honey I Screwed the Kids. Looked it up: She is Soon Yi. . The restaurant catering to Wiccans! You know, the people who claim to be religious witches. The Engrish has you decline! Once upon a time, in a far away land, there were some very bad children. One day, their grandmother who owned a restaurant, go totally annoyed by them. So she cut them up and cooked them, and fed all her guests a dish of child. Finally the last of the children were gone. Now children. We are all going to be good….Aren’t we? This happens to be one of the worst cases of “Japlish” I’ve ever seen! The English bears only somewhat of a resemblance to the Japanese! No elementary school children under fourth grade allowed on the premises. For elementary school children in grades higher than fourth grade, no dishes other than what they ordered allowed on the premises. (Again, this time the http://www.engrish.com lettering covered over the Japanese so this is once again, only a guess. I think this last one is basically saying “no outside food allowed, students must eat what the school serves them”. As for where the kids in pre-school, kindergarten, and grades one through three are supposed to spend their time…sure beats the heck outta me. The whole “decline” thing must be from some doofus looking up how to say “we ask you not to” in English and just picked what looked good out of the dictionary. Once again, there are a bazillion Gaijin in Japan barely eking out a living teaching English in “grind ’em up, spit ’em out” private English conversation schools all over Japan. Cheapskates…all they gotta do is hire one of them who speaks Japanese and pay ’em maybe 2000 or 3000 yen and get an ACCURATE translation.